London Days: Time To Relax! 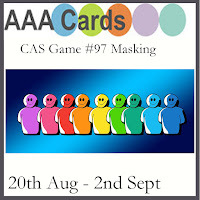 It's the weekend and that means it is time to relax as my card for today instructs! These stamps are all from Verve. I masked off a square area and then water coloured my sunshine background adding a few splatters for interest. Then a touch of stamping and done! I would love to be chilling there now!! Love that watercolor background. Gorgeous! I get a Miami Vice vibe here. I like the aubergine colored panel, it picks up the the color of some of the splatter nicely. 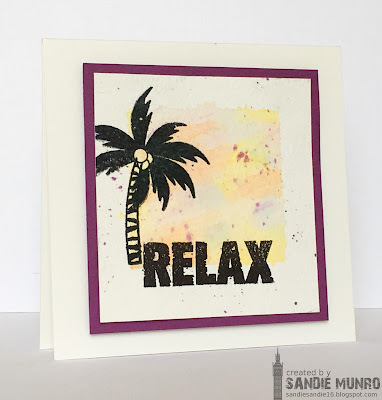 Love how the stamping goes over the edge of the masked space; great card Sandie! Hope you have a fun week planned! Now don't we all need to find a palm tree and relax in the sunshine?! Fab card Sandie and thanks for playing at AAA Cards. A fabulous holiday card Sandie and the perfect way to 'relax' - it's raining here so could certainly do with a little of that sunshine. Thanks so much for joining us at Less is More this week. Lovely card, the soft colors and black are a modern and very nice combo! So happy to see your card here Sandie! Such a striking image and sentiment. I love the impact they have on the masked background. Thanks for playing along with us at AAA Cards! Love that sunshine background! Its beautiful. Great sentiment too. Thanks for sharing at AAA Cards. What a beautiful blend for your sunshine background, Sandie. It's gorgeous, and who knew purple would work with this...fab! A super card, such a fabulous design and great colours. Thank you for joining us at Less is More. This looks wonderful, hon! Very creative, artistic card. I love the background you created and the stamps you used are very pretty. That bold sentiment is fab! Thanks for joining us at Less Is More! Beautiful sky. Great place to read a book. Thank you for sharing with us at AAA Cards!